Get ye to Ingarsby Hall, Melton Mowbray on Saturday February 2nd to witness the Dianas of the Chase! Sidesaddle daredevils both male and female are travelling from far and wide to take part in the Bernard Weatherill Sidesaddle Steeplechase in aid of Forces in Mind, a charity which helps former servicemen and women reintegrate into civilian life. It’s the first of its kind to be held since the Second World War, and although the course has had to be shortened because of the Big Freeze, it’s still a testing mile over big hedges in classic Quorn-hunt territory. 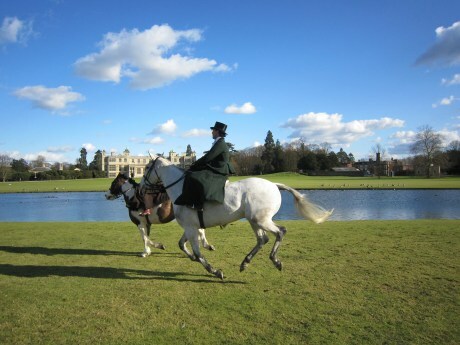 Look out for puissance-record-taker Susan Oakes, Becca Holland of the Flying Foxes sidesaddle display team and Martha Sitwell of Sitwell and Whippet. A few years later the famous jockey George Fordham wrote to Nannie asking for an account of the ride and she replied via her column. There now, is modesty in action. 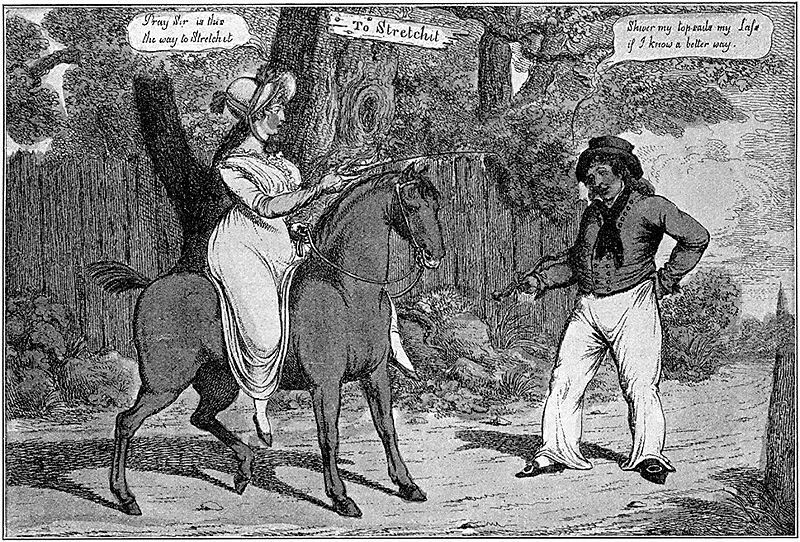 Perhaps Mr Fordham’s version had been confused with that of Regency lady jockey, Alicia Thornton. Good luck and the best of British to the Dianas who will be emulating Mrs Power O’D on Saturday 2nd February. May your mounts all be Pleaders and your leaping horns stay firm. Nanny Power O’Donoghue and Pleader. My Christmas present this year was an hour’s sidesaddle lesson at the Pine Lodge School of Classical Education in Norfolk, with top teacher and judge Sarah Walker. Aside from actually buying me a pony, this was probably The Best Gift Ever. Not only did I get to try a style of riding I’ve been curious about for years, BUT I got to ride a classically trained Lusitano. It was like having a driving lesson in an E-type Jag. When I was researching If Wishes Were Horses (a history of girls and horses) I ended up flipping through a large number of old sidesaddle manuals – in fact, my chapter on the nineteenth century threatened to get altogether out of hand, and I’m still swimming in a surfeit of material. Why was I so intrigued? 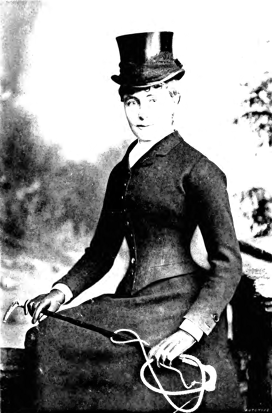 Sidesaddle is pure patriarchy: it was introduced to prevent women getting imagined sexual pleasure from riding astride (as if), from compromising their virginity and therefore their value, and from a belief that the female body was too weak too ride “properly” (and yet it was quite up to childbirth and working a twelve-hour day cleaning rich peoples’ houses – but I digress). What becomes abundantly clear from the literature of sidesaddle’s heyday, is that lady riders thoroughly subverted this notion of frailty. They hunted pell-mell across the most challenging country. They leapt six-foot six-inch fences. They cleared steeplechase courses. They toured nations. 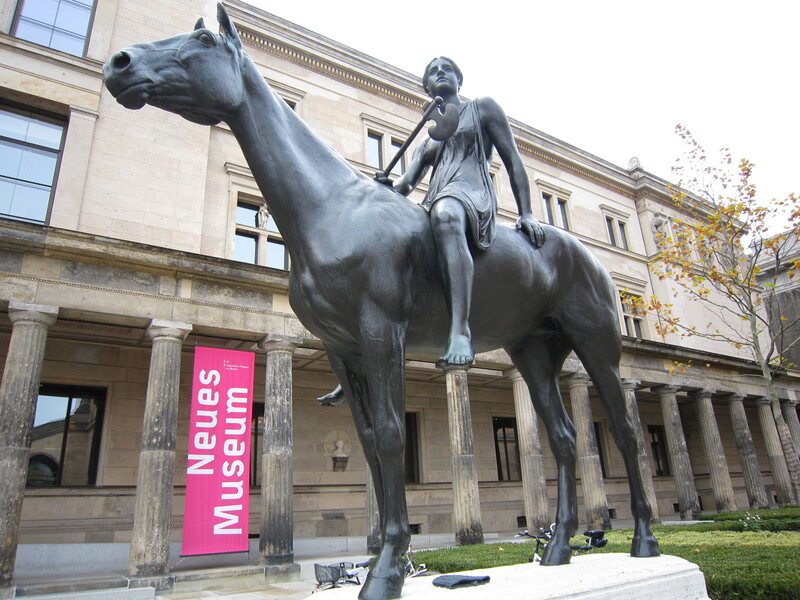 They performed haute école dressage – Jenny de Rhaden would coax her horse to a full rear and lie back on his quarters with her hair trailing on the stage floor of the Moulin Rouge. It’s Fred and Ginger: everything the man does the lady does too, but backwards and on high heels. 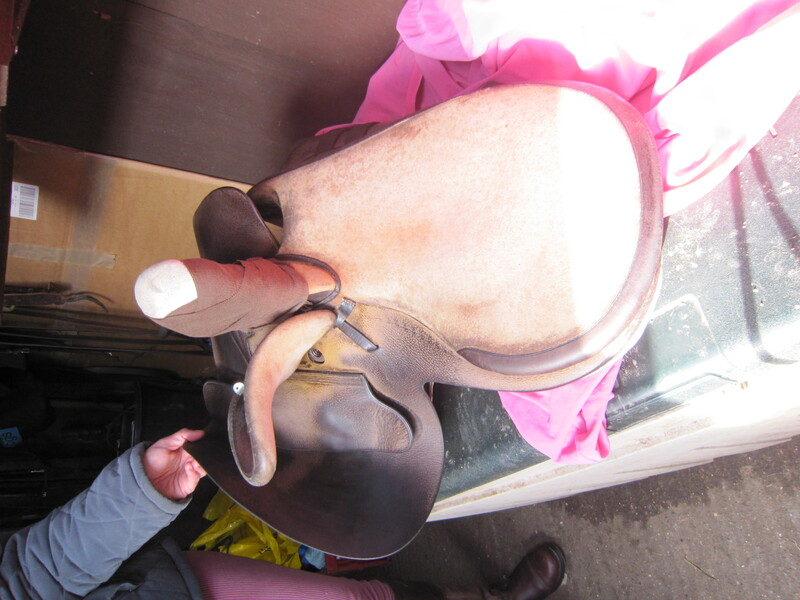 Sarah started the lesson on the ground by showing me the saddle and explaining its various parts. This is a 1930s model, and the deep notch at the withers tells you it’s post-1920s. Each sidesaddle was custom-made for both the rider and the horse, and the lady’s name, thigh-length measurement and her horse’s vital statistics were written inside the frame. 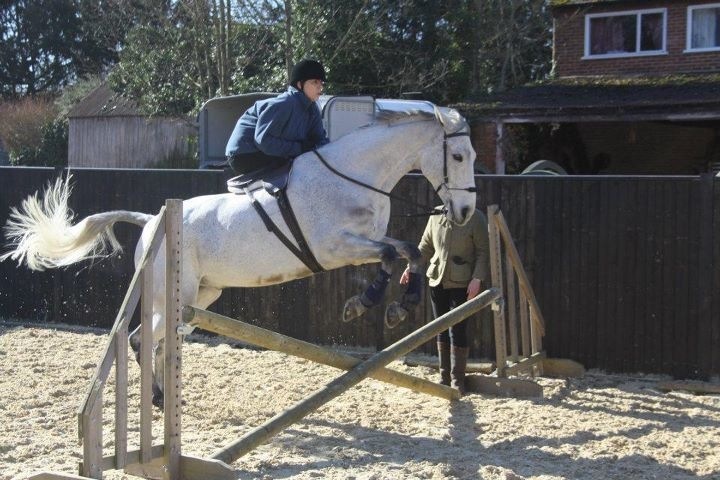 I just about fit onto this one, but if I had a longer saddle, I wouldn’t have fitted onto Xis. There aren’t many downsides to being this tall, but I’m obviously going to have to have my own handmade sidesaddle and a long-backed Luso if I win the lottery. The “leaping head” is padded out with what’s called a “queen”, in this case an old sock and some tail bandages. There was an extra pad for Xis’ shoulder wedged between the numnah and the saddle. 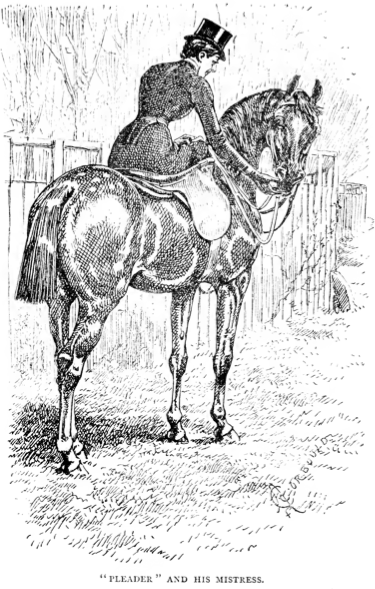 Having read a lot of accounts of hideous sidesaddle accidents, I was pleased to see that the stirrup was attached by an open clasp and would slip out easily if I toppled off, and that the stirrup itself was nice and big. Sarah promised me she’d only fallen off twice in all the years she’d been aside. I believed her. When you’re used to a normal cross-saddle, a sidesaddle is a strange beast indeed. Aside from the forked pommel, there’s the doeskin-covered seat which is flat as a tea tray and shaped like a pilcrow. Once I got on board the patient Xis, I had to chuck almost everything I knew about my seat straight out of the window. You can’t “sit deep” on a tea tray. You can’t squeeze with your legs – not even the lower, left leg – without unbalancing yourself, so you have to make do with waggling your left ankle as an aid. Strictly speaking I should have been carrying a long whip on the righthand side to make up for the missing leg, but Sarah didn’t want to fry my brain and goodness knows, I had enough to think about. I look pretty grim in most of these photos, but there was actually a lot of laughter (I had a small audience including Mum and the stables’ owner, Sue Barber, who knows a thing or two). I was just trying to be in that Zen state when you’re concentrating but not thinking. So how do you stay on? It’s all in the right leg, says Sarah. You actually have a larger “seat” than you have astride because you place much of your weight on that right thigh. It grips the top pommel of the leaping head while your right calf lies flat against the horse’s shoulder and your toe points down (didn’t quite achieve this one). The left leg, waggling aside, feels oddly passive by comparison. In faster paces, jumping or dire emergencies your left thigh grips the underside of the lower pommel. Your torso is just as it would be astride, but you sit far back and your hands are held to either side of your right knee. Having spent years riding a pony with no mouth and a thick neck and also having a general desire to be nice to horses’ mouths, this slightly laidback style suited me just fine. I just kept minimal contact with Xis’ mouth and moved with his movement as closely as possible. 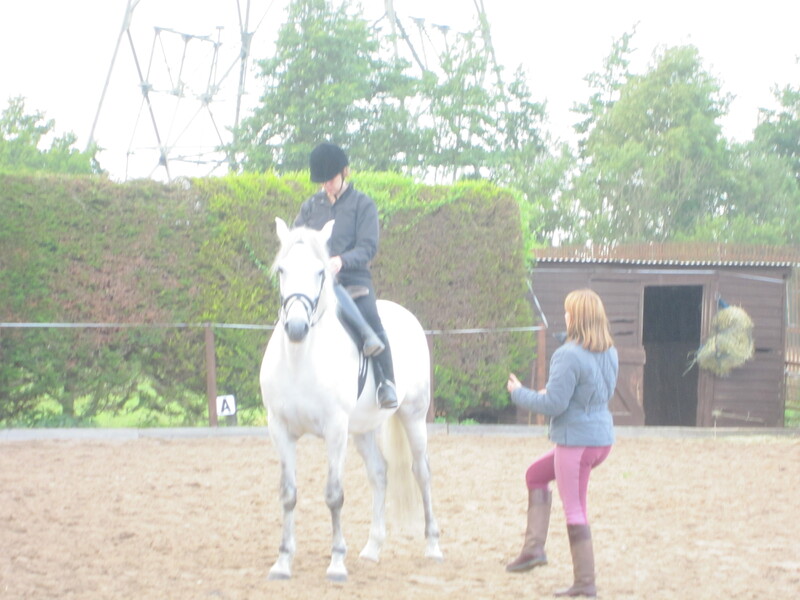 The cliff face on my righthand side, uninterrupted by any pommels or stirrups, kept me focussed on using my right leg as Sarah instructed. 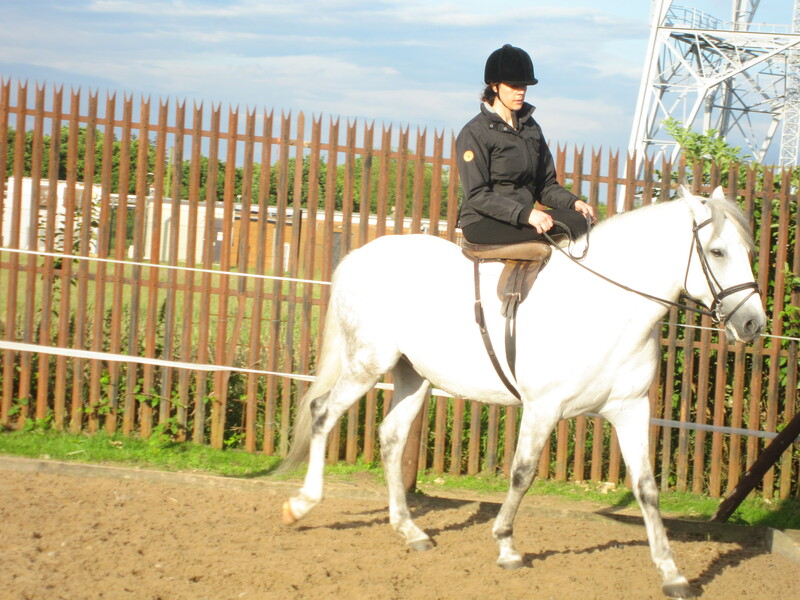 Sarah always keeps the actual riding in a first lesson to a minimum because there’s a lot to absorb and the skills required of both horse and rider are so different. 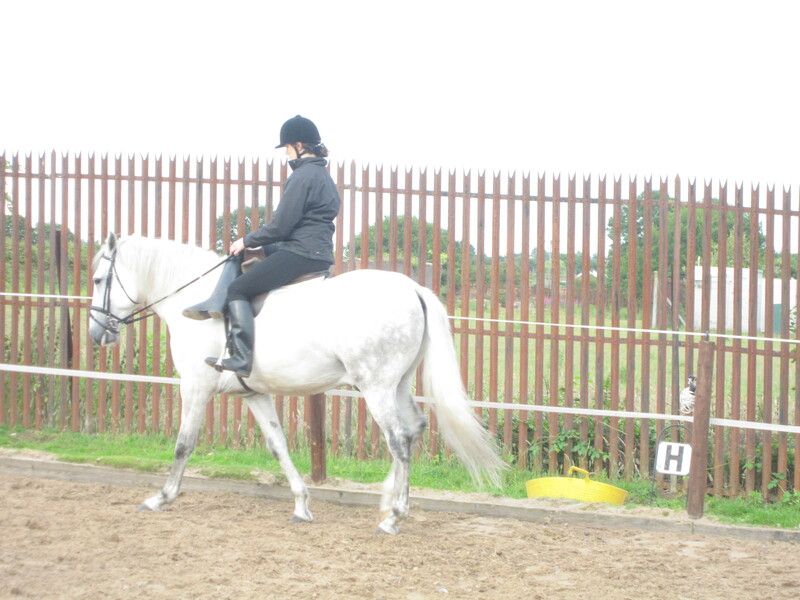 I would walk a few circuits then turn into the centre to switch to sitting astride for a break and instruction, then swing my leg back over and start again. Once I turned Xis in a tight “U” without thinking and found myself clinging on for dear life because he was so responsive and my seat was far from secure. At another point I shifted around a lot to try to get square and he reacted instantly with a little serpentine. This is what’s known as a push-button horse! Eventually Sarah persuaded me to try a short trot. It was like being five again. I bounced, I joggled, my right leg flapped. The seat was so flat that it didn’t help me one jot – I thought I was going to somersault backwards off Xis’ right side. 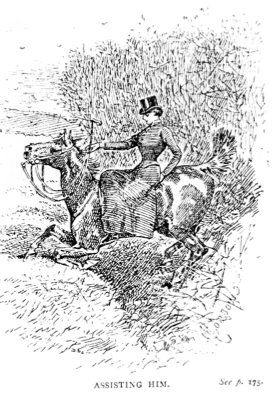 The books I’d read had led me to believe that sidesaddle provided a very secure seat – there are disparaging remarks about lady riders who just lump along on their horses, safely attached by the pommel, and claims that it’s far harder to be dislodged aside than astride. 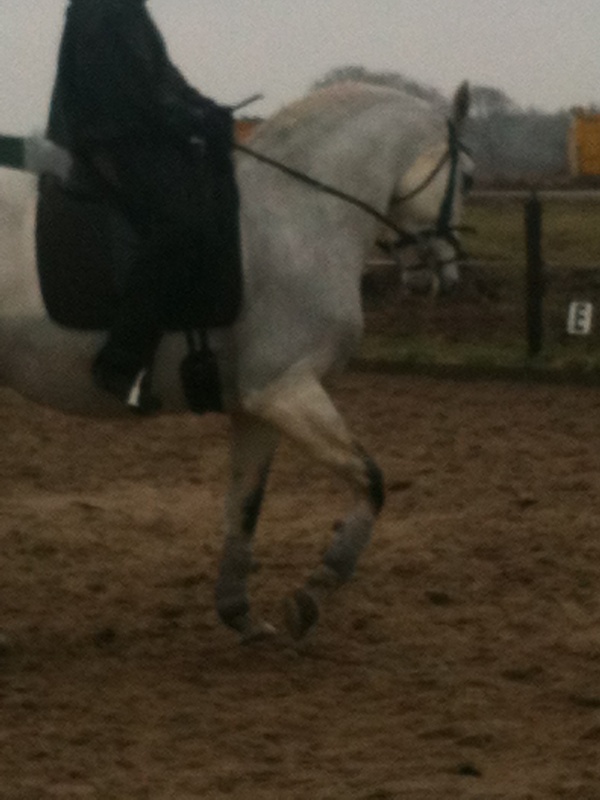 I couldn’t believe this at all once we started trotting, even on a horse with gaits as smooth at Xis’. 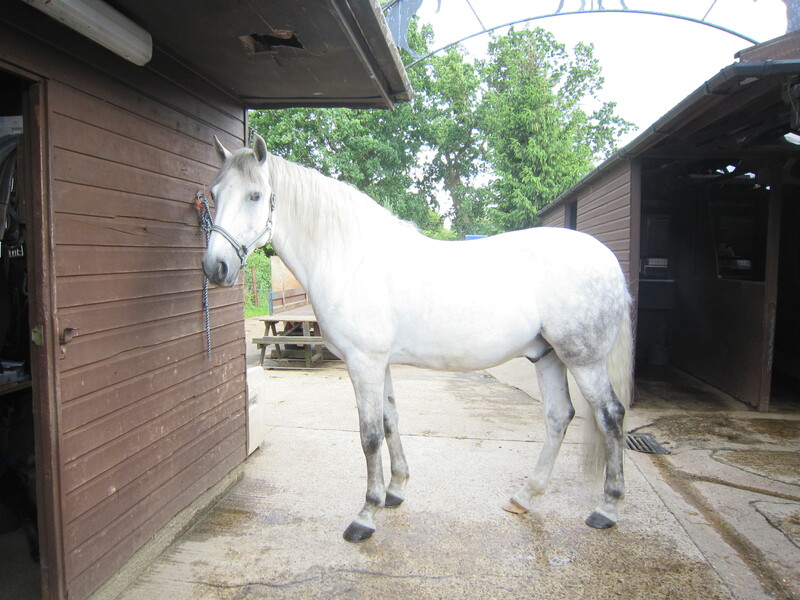 It’s not like mastering sitting trot astride – as I said earlier, you cannot sit deep in the same way, and you are unbalanced from the first. 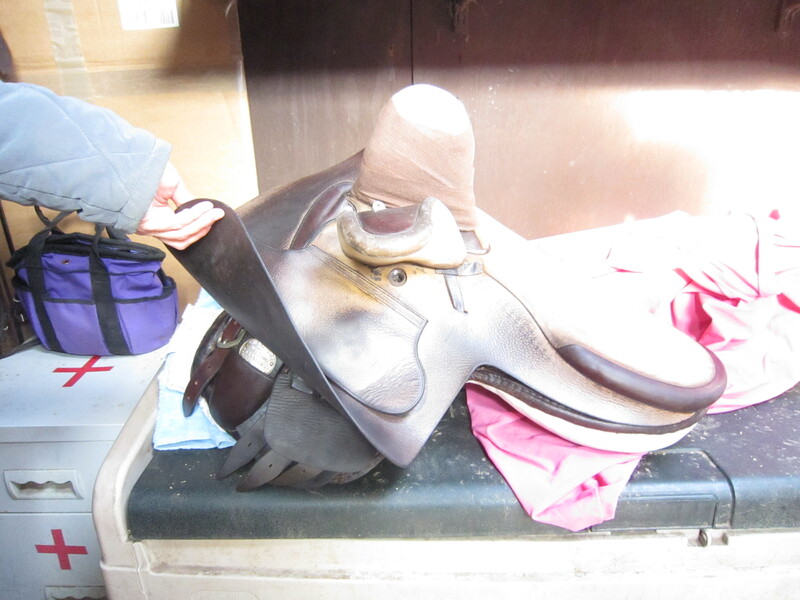 At my fourth or fifth go, it suddenly clicked and there I was, making a creditable go of sitting neatly in the saddle rather than jouncing around like a full potato sack in the back of a flat-bed truck. Xis pricked his ears and got a well-deserved pat, and we called it a day. The damage? Well, despite doing very little actual riding, I was a little tender in the right, er, “glute” and along the underside of my thigh a day or two later, which makes me wonder if Victorian lady riders stumped around with massively overdeveloped right legs. Mum developed sympathy pains just from watching. One thing lasted longer than the muscle soreness though, and that was the desire to get back on and try again. I hope to have another lesson when I’m back in the UK, and am saving my pennies towards that Luso and the tailored sidesaddle. Oh, and the top hat and veil.